I started shooting in 1988 at Bisley Shooting Ground, Surrey. After a short while I was ‘guiding and trapping’ and managing corporate groups and my interest in coaching started. I enjoy introducing a novice to the sport and also helping experienced shots repair a fault in their shot making. I teach both clay shooters and game shooters. I manage all clay shooting activities, events and personal coaching at Upper House Estate, Hayfield in the High Peak. I have regular clients for the shooting seasons and load, drive and coach in the field on pheasant, partridge and duck. 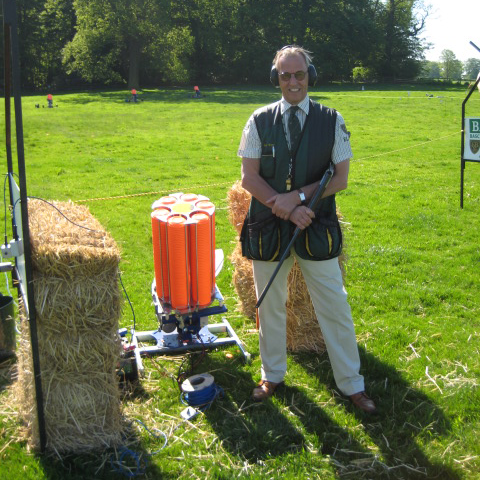 I also coach for BASC at Game Fairs and Improve Your Shooting Days and Ladies Days. I have been coaching almost every week for the past 10 years, except the 12 months between July 2010 and July 2011 when I was employed by BASC on a temporary contract. During my tenure at BASC as Training & Evaluation Officer I worked closely with the national network of coaches, mentors and assessors. I oversaw Coach Assessment Days and took part in the Assessment process for each of the 30+ candidates utilising detailed verbal and written communication in line with the BASC Shotgun Coach Award criteria. At the same time I took my A1 Qualification so I was able to combine my experience and learning to good effect and I am now a qualified Shotgun Coach Assessor. Also during my tenure I developed two shooting related training courses for BASC. The first was for novices called Shotgun Awareness Training (SAT) and the other was for experienced shooters and coaches to become BASC Safety Officers. The courses matched previous Training Specifications (TSPECS) and Assessor Specifications (ASPECS). To support the SAT course I created and edited the 20 page BASC Pocket Guide to Shotgun Basics along with a Wallet Card to support the BASC Shotgun Coaching delivery at game fairs and events. The booklets and cards have proved extraordinarily successful and they help to maintain the BASC coaching criteria for novices and are now also a handy reference for BASC Shotgun Coaches, especially trainee coaches.